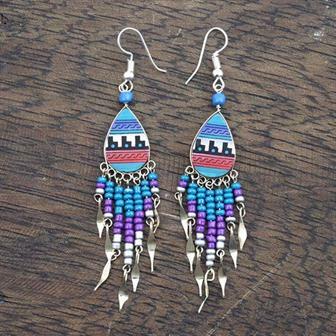 Our selection of Peruvian earrings includes an eye-catching variation of traditional patterns and beads and contemporary detailing. 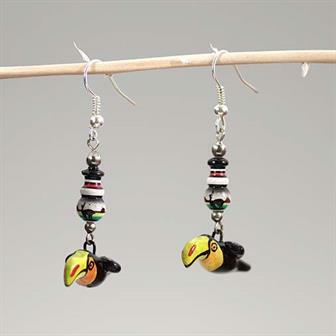 These lovely little earrings are made in Peru and feature images of tropical birds. 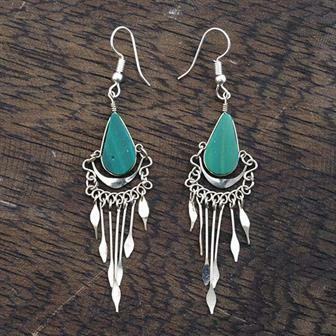 Handmade in Peru, these charming tear drop shaped earrings feature traditional Incan patterns. Hand made in Peru with colourful knotwork material in an attractive twist style. 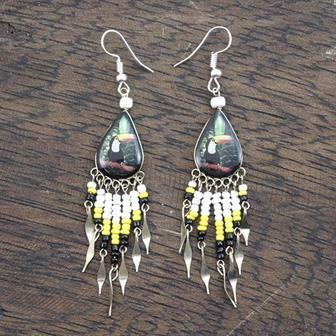 These earrings are handmade in Peru with colourful stone teardrops and matching glass beads. 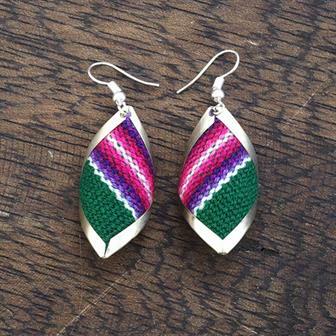 These lovely teardrop shaped earrings are handmade in Peru using colourful stone beads and strips of shaped metal. 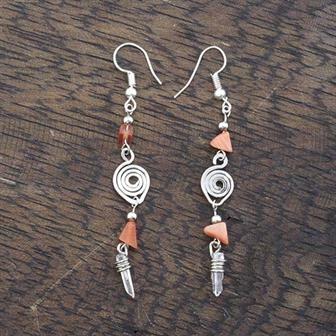 These earrings are hand made in Peru with colourful stones, crystals and a charming little metal spiral. 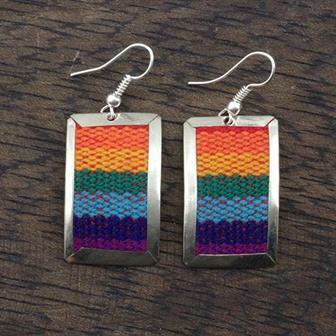 Made using traditional knotwork fabric, these shell shaped earrings are hand made in Peru. 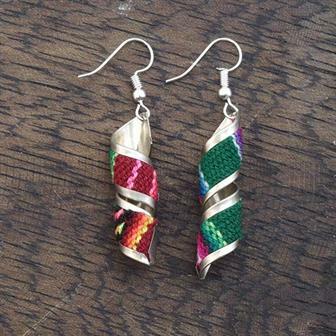 Made using traditional Peruvian knot work fabric, these flat earrings come in a range of different shapes. 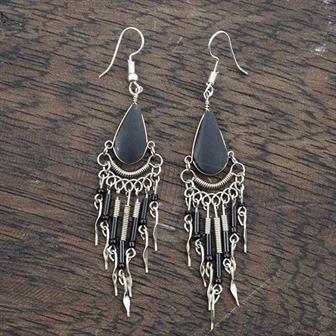 With their dangling metal tines and subtle stone decoration, these elegant earrings are an excellent accessory to any outfit. 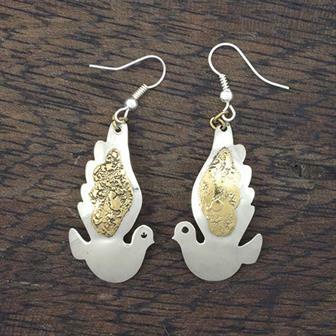 These charming earrings take the shape of a beautiful dove in flight. 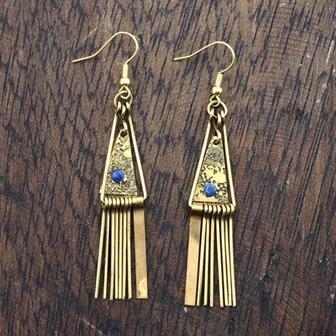 These beautiful swing earrings are handmade in Peru. 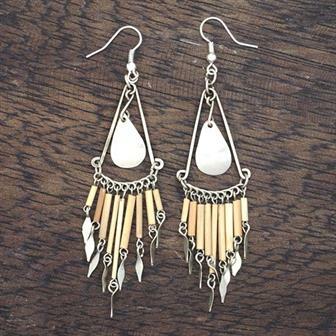 Each pair features rustic bamboo beads and a shiny tear drop centre piece. 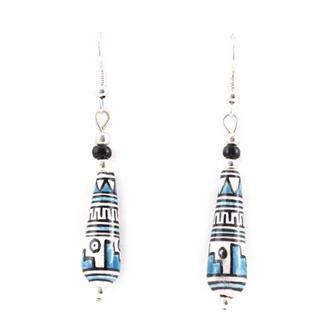 These beautiful earrings use the traditional patterned beads made in Peru. 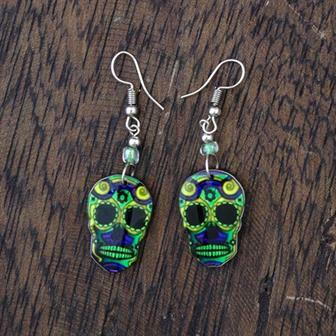 These fascinating and colourful earrings are associated with the Latin American 'Day of The Dead.' The calaveras (Spanish for 'skull') are similar in style to the artwork and iconography of this interesting holiday. 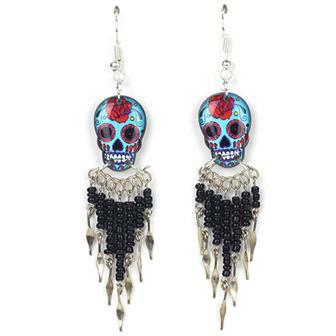 Made with silver plated hooks, plastic skulls and glass beads. 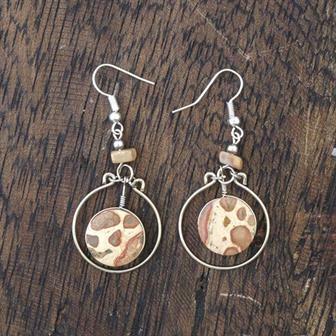 These lovely earrings use colourful round stones with a round metal ring. 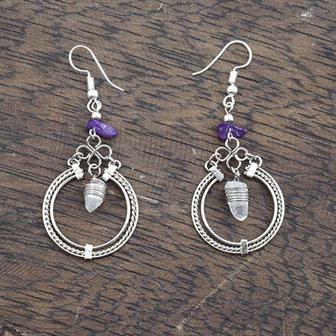 Each pair is handmade by artisans in Peru. 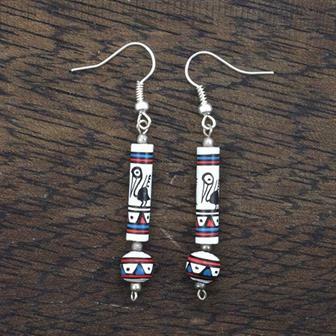 These fascinating and colourful little earrings are associated with the Latin American 'Day of The Dead.' The calaveras (Spanish for 'skull') are similar in style to the artwork and iconography of the holiday. 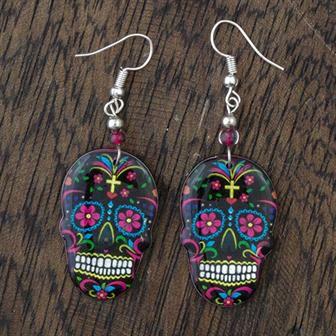 These fascinating and colourful big earrings are associated with the Latin American 'Day of The Dead.' The calaveras (Spanish for 'skull') are similar in style to the artwork and iconography of this interesting holiday.